Ending soon! Amazon Extra 20% Off $75+ Apparel with coupon code 20OFFCLOT through 11/21. Includes select clothing and accessories. Applies only to items sold and shipped by Amazon.com. Eligible items as marked. Shipping is free on orders over $35 or free 2-day shipping with Prime. 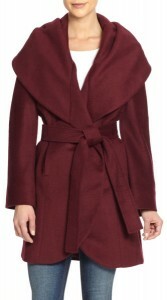 Comfortable and warm wrap-style coat, the Taharia Wool Wrap Coat (pictured) only $158.40 after code (reg. $300) with Free Shipping. Muk Luks Sequin Eternity Scarf only $16 after code (reg. $20) with Free Shipping.